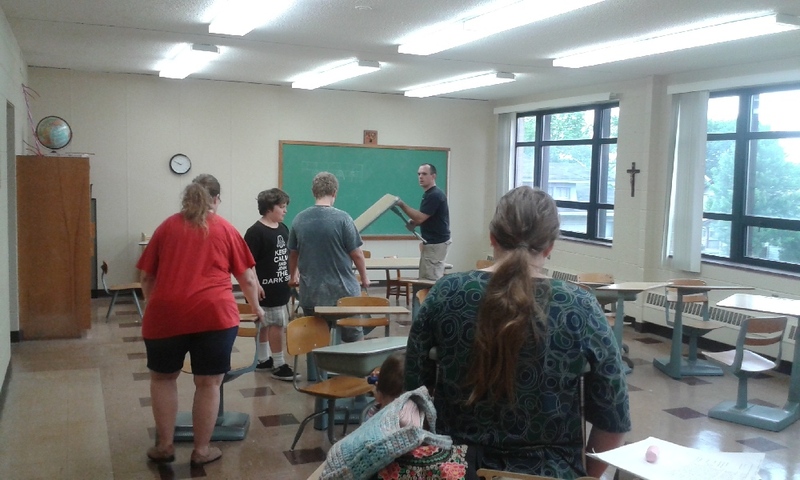 Here are some of our crew beginning to remove old classroom furniture and general detrius from a classroom. Of course work is always better with children around, right? Especially when all the work is on their behalf. 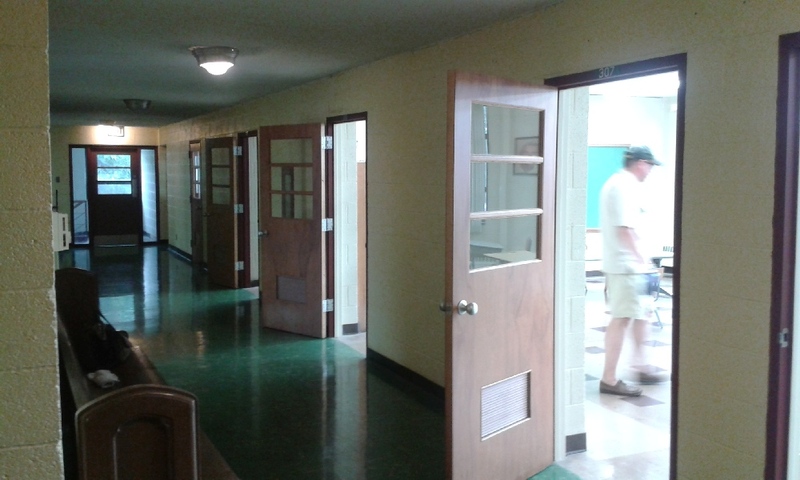 Here is a before picture of the dark hallway. Soon, men would ascend to the ceiling and replace the lights. It looks like a completely different hallway already — just wait until the cinderblocks are artistically painted with trompe l’oeil to look like rustic stone. You can come help us do that on one of our next work days (details below)! 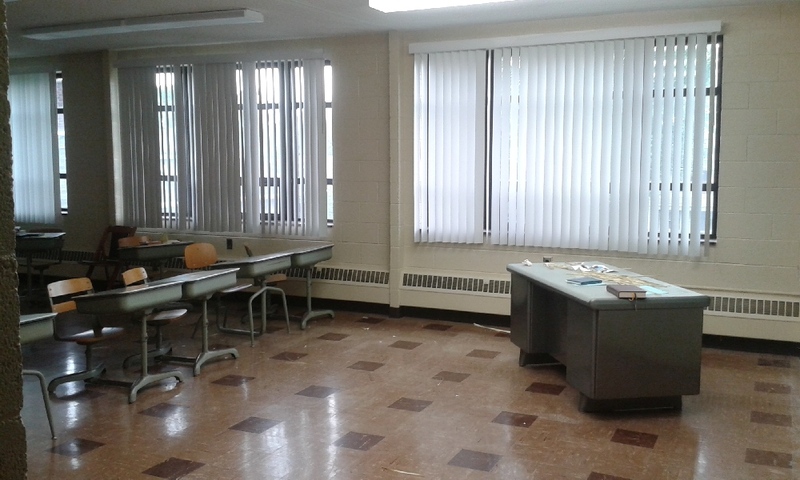 Notice the giant metal 1960s teacher desk. Yeah, we got rid of that. And it sure was heavy! You could hide from the Russians under that one quite comfortably. 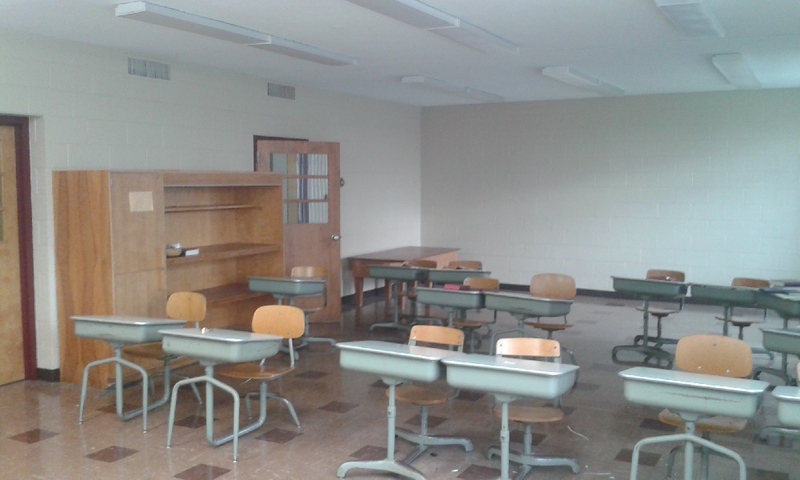 More old school desks we cleared to make room for cleaning, decorating, and new furniture. 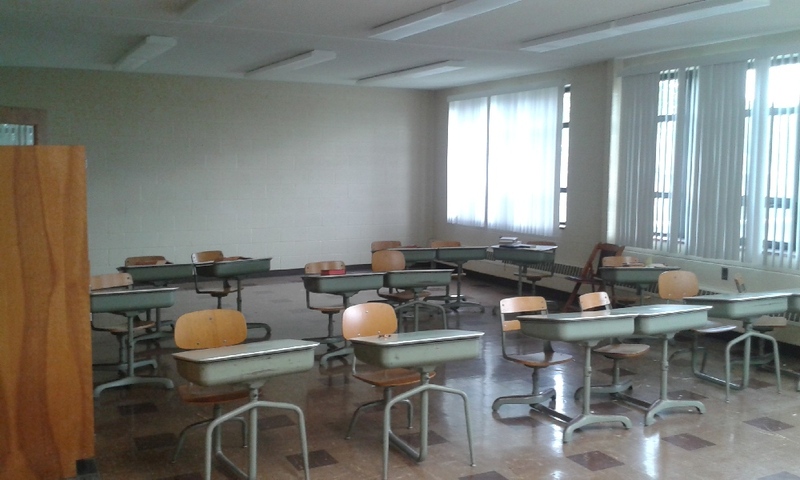 Notice the all-new ceiling lights and the fresh paint job in the classrooms, arranged by the hardworking Redeemer parishoner Effie Sheron. Also the lovely big windows that bring in tons of daylight. 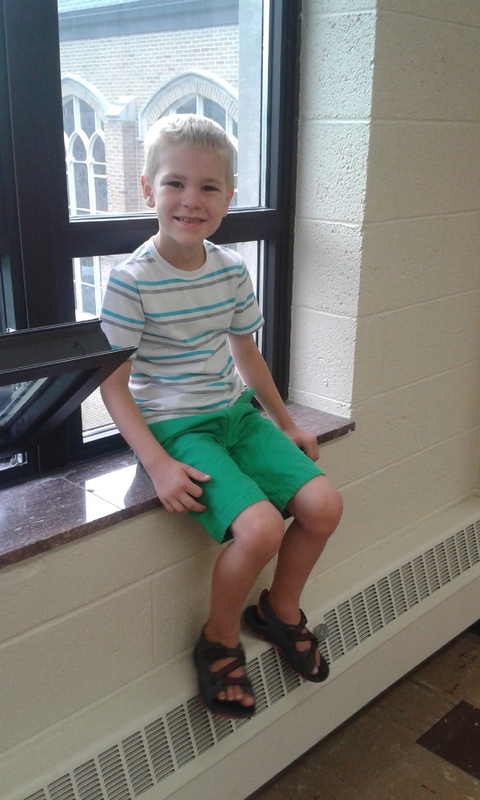 Here is a little six-year-old fellow who will be in Form B this fall and is very excited about going to his new school! 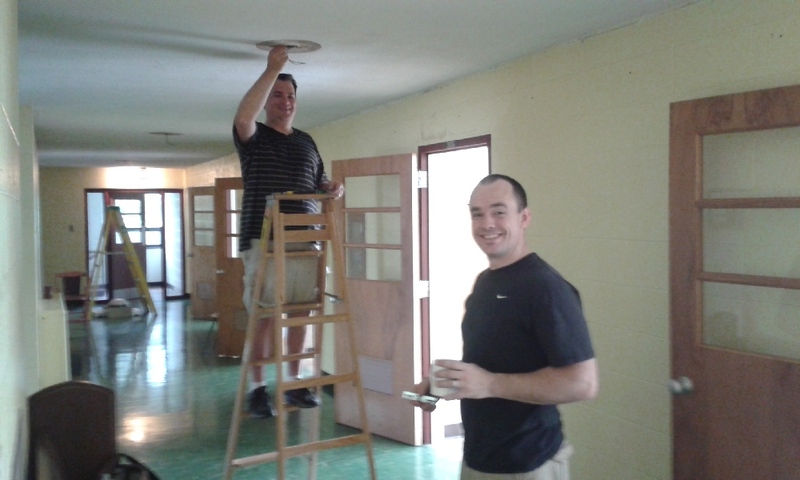 Fort Wayne City Council member and school volunteer Jason Arp valiantly wrassles up new lights in our hallway, with help from school Headmaster Nathaniel Pullmann. They ended up providing vibrant and cheerful lighting. 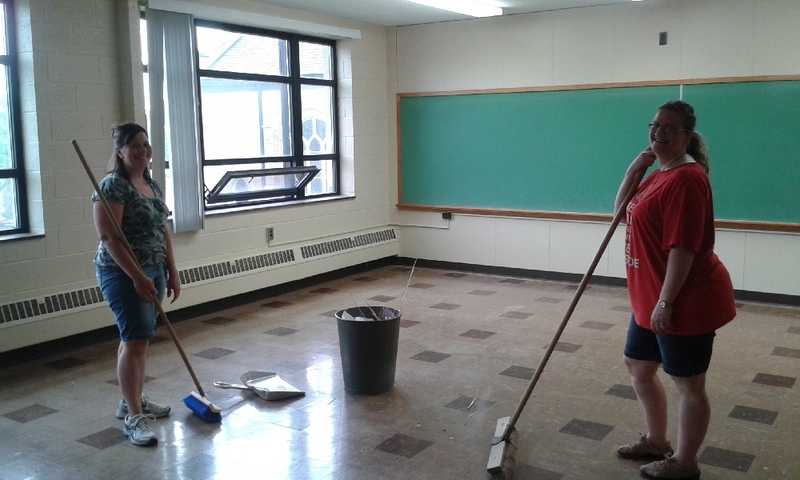 School board member Cindy Arp and Redeemer friend Bethany Haugen scrub away at the floors. We’re hoping to cover this hideous tile in beautiful wood laminate. Wouldn’t that be a lovely gift? Maybe you or someone you know would just love to donate the money or materials to make that happen! Stay tuned for more information about upcoming school build events. Next we’ll be putting up the playground fence, building shelves and protecting rare books for our school library, and putting decorative paint on the walls. 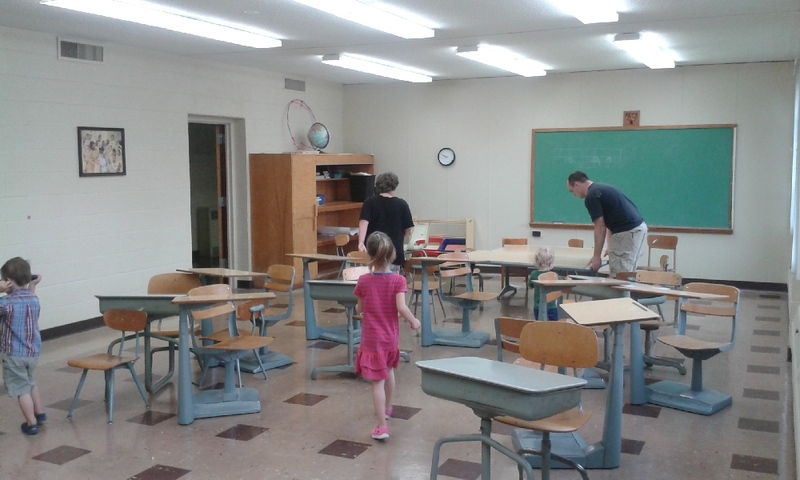 Our tentative dates and times for those events are: June 21, 7 to 9 p.m. (tentative, semi-spontaneous painting day); June 26, 9:30 to 11:30 (library prep day); July 8, 9 a.m. to noon (playground-focused work day); and July 10, 7 to 9 p.m. (more painting plus classroom furniture building!). Get Your Smiling Face In Our Pages At These Upcoming Volunteer Events!